LUTON, UK (KP) - On Tuesday evening, hundreds of Sikh protesters rallied together and protested outside Luton Police Station after a Punjabi female teenager was allegedly sexually assaulted by a 19-year-old radical Islamist male on Monday night. The Sikh community strongly believes that this attack was racially motivated, and is one of the many and growing body of evidences of activity within the Muslim community, however, small or isolated, which preys upon vulnerable Sikh females in an organised way and actively encourages this. The attacked was identified as Anan Majid Basharat a local youth from the Luton neighborhood. According to locals, the girl had been groomed and manipulated for sometime before the sexual attack. Both the victim and accused were students of Icknield High School, which is a dominated with a Muslim majority. According to sources, the family had been to the police a numerous number of times in regards to the manipulation and grooming tactics being used by radical Islamists, however Bedfordshire Police force failed to take any action and failed to realize the historically linked hate crime. 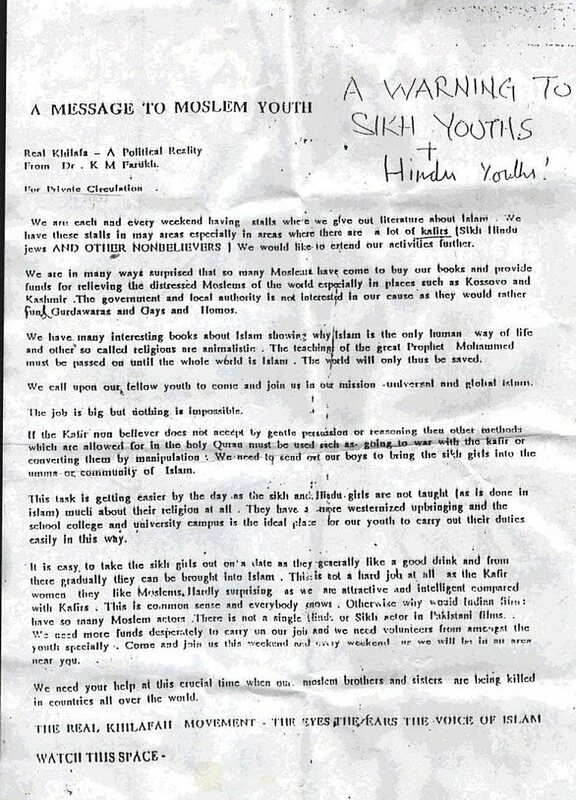 In the mid 1990s the following poster was distributed by radical Islamists widely to Muslim community throughout the UK and was the source of media controversy over how Sikh girls were being targeted and groomed for conversions, many of which were forceful and others through brainwashing by members of Hizb-ut-tahir (HUT), a major radical Islamic extremist organisation in the UK. The Sikh community blocked one side of Stuart Street. Although no one invited the English Defense League (EDL), some of their supporters joined the Sikhs in protest. Representatives from the Sikh community were invited into the police station to discuss their concerns, but police, some with police dogs, eventually guarded the entrance to the station and herded protestors away from Buxton Road. The group were eventually escorted back to the Gurdwara and eventually dispersed before midnight.